The NPS, in partnership with preservation professionals and DC Public Schools, will host a youth summit October 7 – 10, 2016. The DC Youth Summit wants to bring you into a conversation about citizenship, civil rights, and historic preservation. Tour places that matter in the history of the fight for equal rights and earn community service hours. Work with National Park Service staff and historic preservation professionals to improve the ways that these stories are told to the public and in classrooms. In a three and a half day program, student participants will visit local sites related to the struggle for abolition, women’s suffrage, and continuing issues of protest. At the end of the summit, they will share their experiences and present recommendations for how these places can be made more relevant and engaging to students. If you have an interest in history, preservation, and leadership, register now! To mark the DC Preservation League’s 45th Anniversary, the organization will honor individuals, corporations, and projects that have made a catalytic contribution to the city’s civic and cultural legacy. We are pleased to announce the following award recipients to be honored at the 45th Anniversary Celebration on May 14, 2016. Mr. David Bonderman will receive a Legacy Award for his authorship of and advocacy for the Historic Landmark and Historic District Protection Act of 1978 and its catalytic contribution to the preservation of historic resources in the District of Columbia. 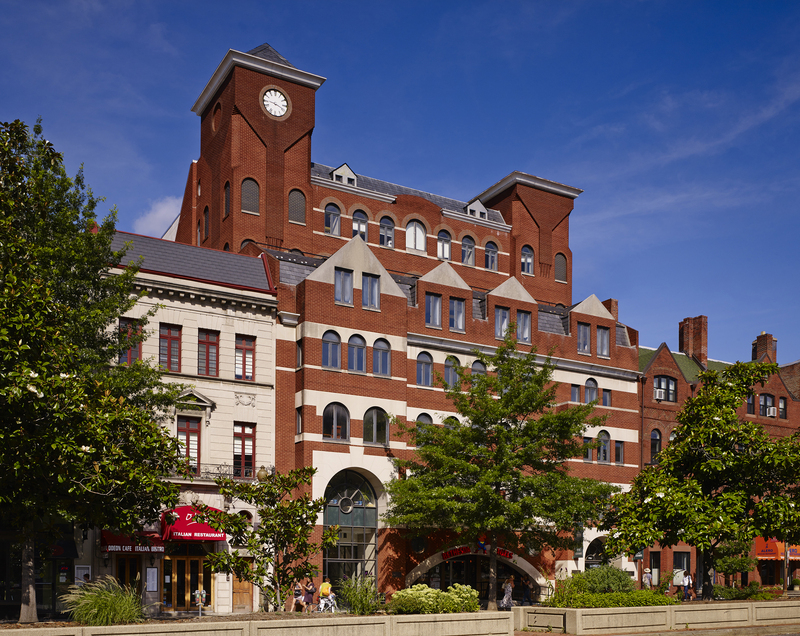 1718 Connecticut Avenue, NW, will receive an award as a significant early example of compatible infill development in the Dupont Circle Historic District in a post modern idiom. Art Deco Society of Washington and Richard Striner, PhD. The Art Deco Society of Washington and Richard Striner, PhD., will receive an award for their important contributions to preservation efforts in Washington, DC. Awardees: Art Deco Society of Washington, Richard Striner, PhD. The Greyhound Bus Terminal will receive an award as an important early example of the adaptive reuse of an under appreciated historic structure that was incorporated into a market driven development. The Capitol Hill Restoration Society will receive an award for its advocacy, education, community outreach efforts and for its early and sustained contributions to preservation efforts in Washington, DC. The Mather Building will receive an award as an example of effective public-private partnership and adaptive reuse that served as a model for projects that integrate multiple uses including office, residential, and arts functions in historic buildings. O Street Market will receive an award for historic preservation and planning for the integration of the historic market building in a large mixed-use program that also included the reopening of a portion of 8th Street, NW; the project has served as a catalyst for significant enhancement of the Shaw Historic District. The R.I.S.E. Demonstration Center will receive as award as an example of the adaptive reuse of a non-contributing building in a historic district intended to serve as a catalyst in an under-served community. Roosevelt High School will receive an award as an example of the exemplary and catalytic rehabilitation of many of DC’s historic public school buildings. The project resulted in the creation of a 21st century academic facility that retains the historic character of a treasured community resource. The Warner Theatre Block (including the new office construction to the east) will receive an award for the catalytic effect of the restoration of the landmark Warner Theatre on the city’s cultural life and the development of the adjacent E Street, NW, block that served as an early and guiding example for contextual new construction. Awardees: Shalom Baranes Associates, Tadjer-Cohen-Edelson, GHT, Sacha Morgan Studio, EHT Traceries, Marshall-KMK Acoustics, LTD. The District Building (John A. Wilson Building) will receive an award for the catalytic impact of the District of Columbia Government acknowledging its civic responsibility for publicly owned historic properties and re-establishing the seat of government on Pennsylvania Avenue, NW. Special thank you to our Awards Selection Jury. Supported in part by the DC Preservation League’s Preservation Initiatives Grant, the Shrine of the Sacred Heart has worked with a specialized contractor to develop gentle processes to clean the efflorescence and grime that stain the John Earley mosaic concrete interior of the church. The processes were selected with little potential for the overcleaning that could damage mosaic concrete, so that we can undertake a volunteer campaign to clean the church. On Saturday, March 19 Shrine of the Sacred Heart will hold a workshop, from 2 pm to approximately 4 pm, training parishioners and others interested in the processes. Trained volunteers will then proceed to address staining inside the church. Those with a passion for Earley’s work, or those interested in lower-cost ways to manage cleaning projects are welcome to join us. The event will take place at the church starting at 2pm. Demolition by neglect is a pervasive problem in DC that affects privately-owned and city-owned historic resources both within and outside of historic districts. Demolition by neglect and permit violations are a matter of public safety, and also stand to destroy the character of our neighborhoods and the city’s built heritage. Action is required to ensure that fines and penalties effectively curb these issues. DC Council has started to address this issue with their current bill, but there is more to be done. The Vacant Buildings Enforcement Unit (VBE), under the Department of Consumer and Regulatory Affairs (DCRA), is charged with investigating and classifying vacant and blighted private buildings to help bring these properties back to a productive use. Click here to see the full 2015 list. Do you have an example or more information to share about a neglected or blighted property in your neighborhood? Help DCPL identify these properties and bring this issue to the attention of DC’s Mayor and City Council. Examples can be submitted anonymously through this link. We can’t imagine Washington without its historic landmarks. Help us build on these successes by becoming a member or making a year-end gift. It’s through the financial support of individuals like you that DCPL has been able to play an important role in shaping the character of the city since 1971. An historic year deserves an historic party – and this will be one you won’t forget! Join us for a celebration of Historic Preservation, Pride and Human Rights at the LGBT & Friends Dance Party! organization in the United States. Today, this mid-century modern building stands as an important symbol to HRC’s ongoing advocacy for equality.